I’m pleased to have Robert Ambrosi, owner of Ambrosi Cutlery, a knife sharpening service located in North Salem, New York. 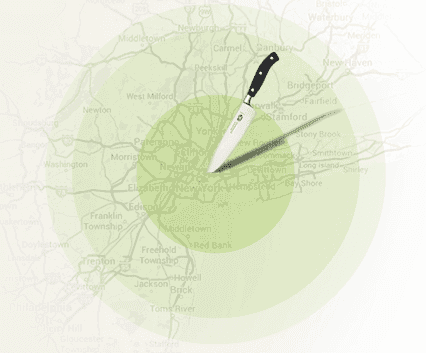 Their sharpening services are used by many of New York City’s finest chefs, butchers and supermarkets. 1. Hello Robert, what’s the first knife that you’ve ever sharpened? The first time i sharpened a knife I was 14 years old. I went along to help my grandfather who was also a professional knife sharpener. I messed up a bunch of carbon steel boning knives that day trying to get a “handle on it“. Thats how you learn. Hands on is the only way. You have to develop a “feel” for it. 2. Tell us a bit more about your sharpening business. I have been sharpening knives professionally for 40 years. I was brought up around knives since I was born. I am a third generation knife sharpener and my two sons Mark and Jason are fourth generation knife sharpeners. 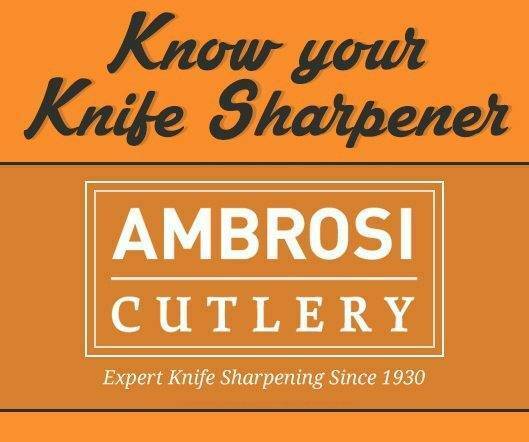 We run a family owned commercial sharpening service: Ambrosi Cutlery Ltd. Knife sharpening is all we do. We know knife sharpening! 3. Can you share your sharpening technique with us? We use various methods and sharpening techniques depending on the type of knife, its blade construction and its application. If you look at our website you will see various methods being used. I use different types of stones depending on the type of edge we want to produce. We have the ability to produce convex or concave bevels and variations of either type. We use 36″ diameter wheels with a water bath. We use cup wheels, spiral wheels and the traditional whetstones. I still have stones that were used by my grandfather. Hand eye coordination is the key factor when sharpening. 4. How long do you think it took you to master the sharpening process? I don’t recall how long it took to master it. I can say that it does take years to understand all the styles of sharpening and various edges . It becomes second nature after so long. You look at a knife for less than a second and you can immediately recognize the type, the brand, how dull it is and if it has been improperly sharpened. It takes years but once you get the eye for it, it’s second nature. 5. What’s the one thing you struggled with the most when you started sharpening knives? The main challenge was maintaining the shape of the blade. How much pressure to apply and where to apply it. Knife shape is key! Changing the geometry of the shape and/or edge angle will hinder the performance of the user. A properly sharpened knife has a shape that is designed to be used as an extension of the natural motion of the users hand. Shape of blade is determined by the purpose it is used for. Knife sharpening is an art. 6. Should a beginner practice with cheap knives first? Starting with cheap knives is a great idea! it will take a long time and a lot of knives to get the hand for it so you don’t want to ruin good knives. 7. Based on your experience, what’s the most common beginner mistake? Beginners will not have the eye for the shape and will dig in certain spots on the blade. Nothing wrong with that. That is how you learn. Read all the books you want and watch all the videos you like. Like they say…”ain’t nothing like the real thing“. Hand control is the best way to describe it. 8. Is your technique still improving? Perfect sharpness is a constant goal achieved only by proper thought processes before the actual sharpening. 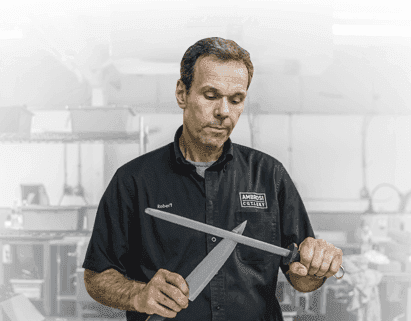 Learning how to use a sharpening steel to help maintain the edge of a knife is also a necessary skill for knife users and sharpeners alike. Proper steeling technique will prolong your time in between professional sharpenings. We have a video on YouTube which gives you a good idea and lesson on proper steeling. A steel used the wrong way will ruin an edge, but properly used at the right times can work wonders. There are different “cuts” of a steel that produce different edge results. The finer the cut the smoother the edge and so on. I tell my clients that your steel is your knives best friend. 9. Do you remember the most expensive blade that you sharpened? The most expensive knife I ever sharpened? I don’t remember any particular one. There have been many. I have done Kramer knives, Masahiro, Kikuichi, Shun and many others. 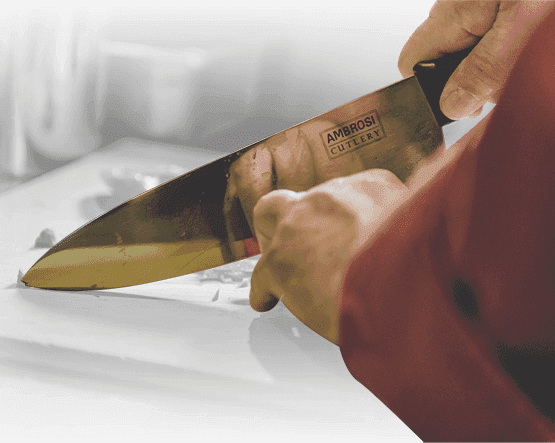 Remember this: a knife is only as good as it cuts. 10. Are there knives that you don’t like to sharpen? Why? I do not like to sharpen cheap steel . You might get it to cut but it will not hold its edge. There is a reason why good knives are not cheap. Most cheap knives are not tapered either. It does start with steel quality but tapering is also a key attribute of a well constructed knife. Tapering from spine to edge and from heel to tip. That is a critical feature necessary to produce what I call a “built in” sharpness of a knife. Wusthof Classic vs Gourmet: Which one is better?